The A1 provides moderate support for mild to moderate ankle sprains. The A1 ankle support incorporates improved Flyweight-Tech for a lightweight, low profile design and enhanced construction. The A1 is built with a-Fit design for an anatomically (left and right) correct fit, and i-Fit technology allowing for individualized adjustments and compression. The Exo-Grid (Internal) has dual internal stabilizers, which provide both lateral & medial ankle stability. In addition, the L-Strap and Y-Strap Stabilizers with Grip-Tech, anti-migration technology, stabilize the ankle and prevent it from rolling inwards (Inversion) by adjusting tension on the straps. 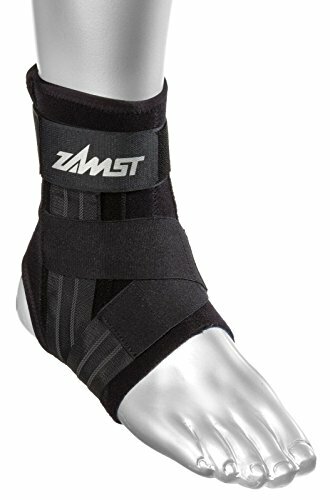 Ideal for preventative application and/or for supportive use after mild or moderate ankle sprains. On average it can cost an individual at least twice as much for tape vs bracing for a season. This is a preferred option for many basketball, volleyball, and football players.